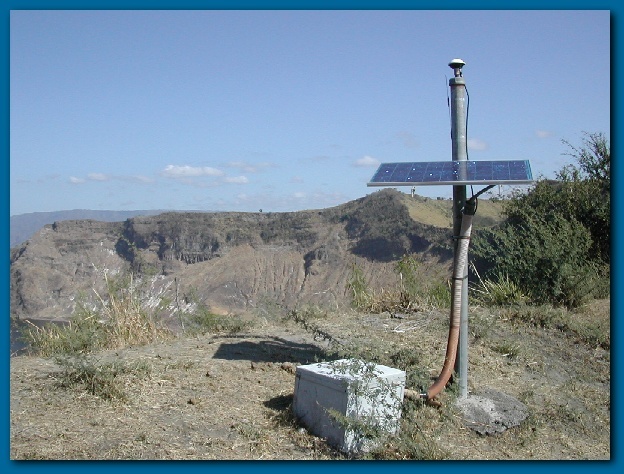 The Taal Volcano L1 GPS network was installed in July, 1999 with yearly maintenance trips since then to improve and expand telemetry and observation points. The network currently consists of 12 remote continuous L1 stations in addition to 3 continuous dual frequency stations. The L1 network uses a Time Delay Multiple Access (TDMA) protocol with three repeaters located on the caldera ridge and Napayon Island. Each station is powered via a single 53W panel and 80Ah battery. Data is collected on a computer at the Tagaytay PHIVOLCS Seismic station, downloaded via point to point radio link, 50km to a computer on the internet in Manila, then sent to the UNAVCO data archive. For this maintenance trip, telemetry paths were improved, general physical maintenance performed and we replaced of all batteries in the network. Two sites that had been previously pulled due to theft were reinstalled. Existing GPS antennas were replaced with newer, lower profile, better sealed units. Taal Volcano, with a peak elevation of 310 meters, is an island within a lake, within a larger caldera, with a elevation of 640 meters at the Tagaytay Ridge. The 23 sq. km island contains 35 cones and 47 craters, including a 1.9km diameter main crater with lake (ph 2.3-2.5). There have been 33 recorded eruptions since 1572, the latest being a phreatic eruption in 1977. The last destructive eruption was in 1965, ashfall covered a 60 sq. km area and killed 200 people.